Below are two market internal indicators that are clearly showing distribution going on behind the scenes. 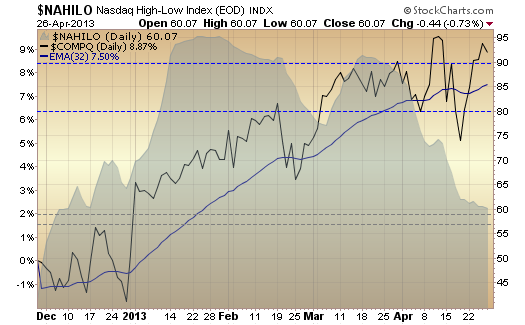 The Nasdaq and Dow are at or near highs while these hi/low indicators are hitting levels not seen since December. Considering my bullish timing indicator flipped January 4th and that is when I turned bullish on the markets we are below those levels. It shouldn’t be long before the general markets follow suit. Yes, that’s why they say that topping is a “process”. Small retail investors have reportedly been moving $billions into stocks since the beginning of this year. 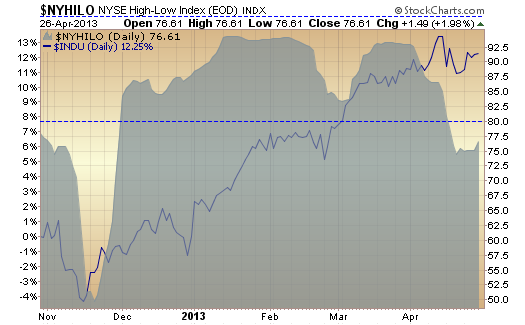 You wouldn’t tell from the charts however, as the Nasdaq is barely 50 points higher than it was in mid February. So, some participants in the market must be selling with both hands while the small investor is lured back into the market after 4 years. Stocks are near all-time highs, the seasonally weak period is starting, rallies seem to be sold, and we haven’t had a proper correction for months. Never mind that recent economic data are weaker than expected. I prefer to watch from the sidelines when all these ingredients are in place. Selling into the “suckers”…no liquidity really underneath…the time for a BIG drop is nigh…i m H o…!! Markets seems doesn’t care about the economic data. If we have a correction, it will be very light, because everybody wants to buy the dip.